We recognise the importance of keeping warm during the winter months and the possible impact which it has on our health. 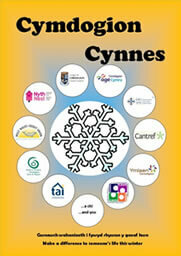 In an attempt to ensure that Ceredigion residents do not have to endure living in cold conditions, organizations throughout Ceredigion have come together to develop the Cymdogion Cynnes Pack which includes information such as grants and funding assistance, keeping well during winter, keeping yourself warm, financial advice and a directory of relevant services. Over 1100 Ceredigion residents are buying fuel together in clubs across the county. The clubs have successfully delivered enormous benefits to their members, with many serving their communities for several years. They have been set up and organised by highly motivated people working on a voluntary basis. An oil buying syndicate (also known as an oil club or oil co-operative) enables people to join together to bulk purchase heating oil at a discounted price. Syndicate sizes can vary, from just a few neighbours, to larger community groups with a hundred or more members. In most groups, orders are managed by one or more volunteer co-ordinators who negotiate a competitive price from fuel suppliers. Savings – Syndicate members can benefit from financial savings. Savings are made on bulk purchasing but they can also be made because, on becoming part of a syndicate, people with existing long term agreements sometimes find they are already paying higher than average prices. In some cases in Ceredigion, people have saved up to a third on their fuel bill. Find your club and contact your local coordinator, they will let you know how the club runs and what details you need to give them, most run via email or through a central community center. For details of your local club please visit the ‘Club Cosy – Ceredigion Fuel Clubs’ page on the Ceredigion Council website. The National Exercise Referral Scheme (NERS) is designed to aid individuals, who have been identified by their Medical Practitioner, to take up the benefits of participating in high quality, supervised, enjoyable exercise programme to improve health and wellbeing. The scheme can be obtained through a visit to your Doctor’s Surgery, who will refer you to a member of the Ceredigion County Council Health Intervention team to contact you. Dysgu Bro aim to provide learning opportunities for the people of Ceredigion in their community which will encourage the development of new interests, work towards gaining a qualification or improve skills in the workplace. Where can I access Dysgu Bro Courses? Staff from Mid and West Wales Fire and Rescue Service now offer Free Home Fire Safety checks and will supply and install a smoke alarm free of charge. If you are feeling unwell, ‘Choose Well’ can help you decide whether or not you need to seek medical attention.